Our education programs are developed by our team of qualified educators to meet the needs of each individual child in our care. Educators observe children’s development and then plan exciting and interactive experiences that scaffold each child’s learning, to take them to the next level of understanding. Educators are guided by the Early Years Learning Framework (EYLF) and our Shine Advantage curriculum when creating their educational programs. Goals are set for each child by educators in conjunction with families, and educators support children in achieving these goals throughout the year. Families are provided with access to portfolios for their child, which contain a variety of works, learning stories, developmental checklists and summaries of development throughout the year. Each day parents are emailed a Daily Journal to keep them informed of their child’s activity, progress and involvement. It’s a great talking point at home and gives children a chance to recall the day’s events and tell their family all the exciting things they did that day. Families are encouraged to have open communication with educators about their child’s development and how they are progressing throughout the year. Opportunities are available for parent meetings should you want to discuss your child’s development in depth with their educators. We know children learn best when they’re interested and engaged. That’s why we offer play-based learning experiences that are meaningful and relevant for your child. Our educators draw on their professional knowledge and experience to create a fun and challenging program for your child each day. We observe your child closely to identify their interests, strengths and abilities, then select the right teaching strategy and learning environment for that experience. 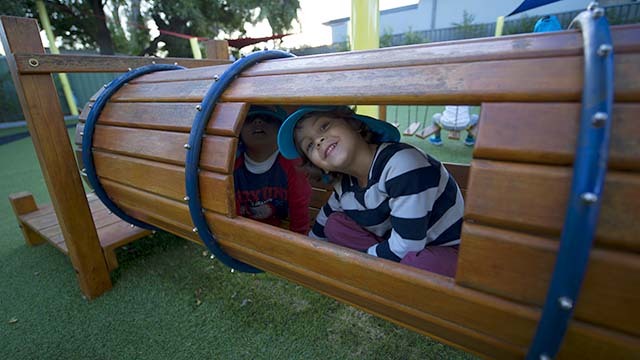 The Early Years Learning Framework (EYLF) is part of the Council of Australian Government’s reform agenda for Early Childhood Education. The Government has developed this Framework to help educators consistently provide young children with opportunities to maximise their potential and develop a foundation for future success in learning. Fundamental to the Framework is a view of children’s lives as characterised by belonging, being and becoming. Experiencing BELONGING is integral to human existence. Children belong first to a family, a cultural group, a neighbourhood and a wider community. Belonging acknowledges children’s independence with others and the basis of relationships in defining identities. Belonging is central to being and becoming in that it shapes who children are and who they can become. BEING recognises the significance of the here and now in children’s lives. It is about the present and them knowing themselves, building and maintaining relationships with others and engaging in life’s joys and complexities, and meeting challenges in everyday life. Children’s identities, knowledge, understanding, capacities, skills and relationships change during childhood. They are shaped by many different events and circumstances. BECOMING reflects this process of rapid and significant change in the early years as young children learn and grow. It emphasises learning to participate fully and actively in society. encourages a sense of wellbeing. We’re proud to announce that our Sylvania service has been rated Exceeding the National Quality Standards in all seven Quality Areas.